The Cannes Lions Health jury leaders also explained changes to the awards at an event in New York this week. NEW YORK: Cannes Lions Health jury presidents John Fidelino and Rich Levy, speaking at an event in New York this week, lamented that a major holding company such as Publicis Groupe will not be entering work at this year’s festival. 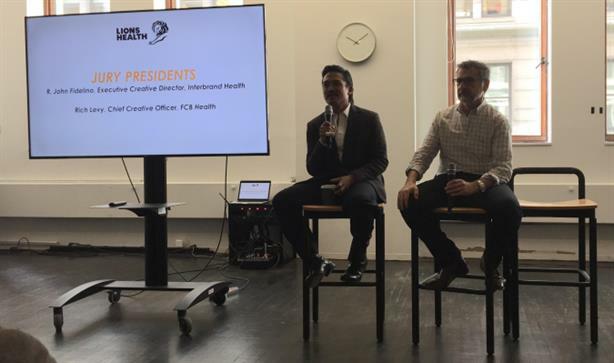 Levy, chief creative officer at FCB Health, and Fidelino, executive creative director at InterbrandHealth, spoke about the changes to Lions Health and what they’re hoping to see at this year’s Cannes Lions International Festival of Creativity. "Every holding company has reasons for not doing what they’re doing," Levy said. "The more the merrier. The more companies that submit, the better the work. I think it’s a pity [Publicis will not attend] and I wish they would reconsider." Levy specifically called out Publicis subsidiary Langland as a major missing piece. Fidelino echoed Levy’s idea that the work gets better when more health agencies are part of the awards. "I don’t think healthcare wins if you’re not in it," Fidelino said. "We, especially health-focused agencies, need to make a case for what we do. It’s important we discuss what we do and important we have forums to discuss what good work is. This is one of the few times we can discuss and debate what work is good or not good. I think it’s important for everyone to be in it." Levy and Fidelino had the same to say about non-health agencies and companies winning Lions Health awards. Levy encouraged agencies to enter health work into other categories, saying, "We can invade their festival, too." "I think there is a threat, but the cross-fertilization of ideas is good," Fidelino said. "The onus is on us to bring to the table what we’re good at, what we’re great at." Lions Health have implemented changes to make submitting work in the right category simpler. The entries will differentiate between regulated and unregulated work, as well as audience types, and separate charity and NGO work from brand work. Agencies can also only submit entries in either the Pharma Lions or Health and Wellness Lions, but not both. The festival also made major changes to the structure of the overall awards after criticism last year. The changes were an effort to make it easier to compare similar work and make judging easier. "What’s interesting about health is there is a spectrum that spans form health and wellness to physician administered therapies," Fidelino said. "The distinction between the two groups is more about what type of company are you that’s creating the work. What this does is say there’s a whole school of companies out there who are nontraditional health companies and what this does is says come into the space."